I’m going to talk about a television ad today. It’s a commercial for a baking company. The ad is in English with Japanese subtitles. It begins with a voice-over narration saying “it was a small shop in a port town”. Ring any bells? Then you see a girl in the shop making a sandwich. She serves it to the customer who happens to be an English gentleman. He has a bite and says “Delicious!” and asks “What’s your secret?” The girl says “It’s a long story”. 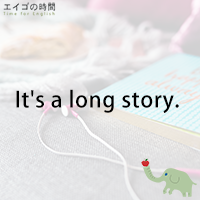 “It’s a long story” is an idiomatic phrase. When someone has asked you about something that has happened and you don’t want to explain it to them because it takes too long or it’s too complicated. Then you can say, “It’s a long story”. It can be a polite way of saying “I don’t want to tell you”. So, when someone says it’s a long story, it may sometimes be a good idea to drop that conversation right there. Next Post じゃあね。 – I’m gone.